enmity: Blk.Jks, Haezer, Enmity, Richard the 3rd at The Assembly in Cape Town. Blk.Jks, Haezer, Enmity, Richard the 3rd at The Assembly in Cape Town. With a new album that captures new sounds, Enmity are playing new line-ups. Catch us on the 8th of August for something entirely different at the Assembly. 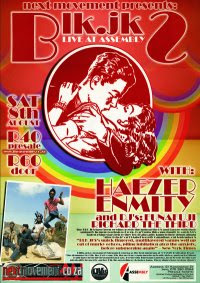 Super-band BLK JKS from JHB will be headlining the stage, with some heavier electronic vibes provided by Haezer. DJ's FunaFuji and Richard the Third will keep everyone entertained with their deck spinning skills, and somewhere amongst all of that, Enmity will be providing your metal with distinctive electronic edge. Dont miss out, sure to be something special. The BLK JKS have been wowing crowds throughout the US and Europe with their uniquely homegrown fusion of rock. Don’t miss this opportunity to catch SA’s fastest rising stars before they jet off abroad to launch their debut album ‘After Robots’ on US label Secretly Canadian, out Sept 8th. We hope you're as excited as we are to come check out this fusion of creative music. Tickets are R40 presale (www.theassembly.co.za) or R60 at the door. Enmity will bring through some albums and shirts to sell too, so bring a little cash if you haven't picked up your album yet.